Communication Box is a message system using TM-Intelligent printers. Communication Box allows you to exchange messages between devices with simple programming. Normally implementing a message system requires understanding of the communications system such as installation of the designated server and handling errors that occur in message exchanges. However, Communication Box covers processes such as saving and synchronizing messages and recovering from disconnections. Therefore, the requirement to the application software that sends messages is only to manage the outgoing message contents, and the requirement to the application software that receives messages is only to display the incoming message. Communication Box can handle both text and image data as messages. You can create groups with multiple devices on Communication Box. This allows the user to send messages to all devices in the group as well as sending messages to a specific device. The transmitted messages are saved on Communication Box up to a certain volume. Therefore, devices that were not connected at the time of data transmission can receive the message when they are connected again. Group a smart device at the cashier and a smart device facing to the customer. 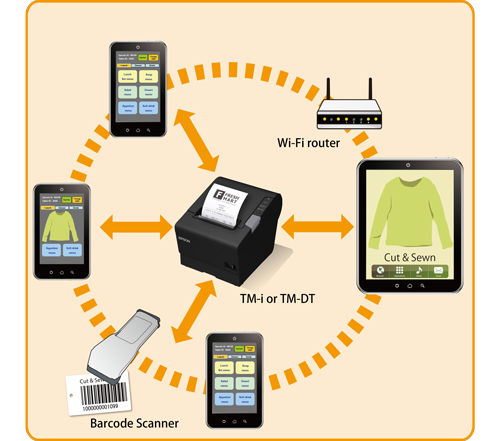 As a barcode is read by the scanner connected to a TM-Intelligent printer, the product information is also displayed on another smart device for the customer. Group a smart device at the reception and a smart device for the customer. The status of reservation entered at the reception is displayed for the customer. Group a smart device for the shop administration and smart devices at different product areas in the shop. The administration device can display suitable advertisements on smart devices in each area. Group smart devices for waiters and smart devices (display devices) in the kitchen. As the waiter enters the order to the smart device, the order is displayed on all the smart devices in the kitchen. The cook accepts the order and starts cooking. The accepted order disappears from the display. As the cook enters the cooked item on the smart device, it is displayed on smart devices for all the waiters. As a waiter near the kitchen takes the item and accepts, the item disappears from smart devices for all the waiters. You can use the following development tools to implement a system with Communication Box. You can group devices that run application software developed by different development tools. See the User's Manual of each development tool for more information on Communication Box.